The log cracks as it’s plopped on the glowing embers emitting a welcoming warmth. It’s that time of year and I’ve already curled up by the fire a few times already this fall, have you? While a crackling fire is totally enjoyable as is, let’s not just sit there zoning out to mindless TV, let’s do something! 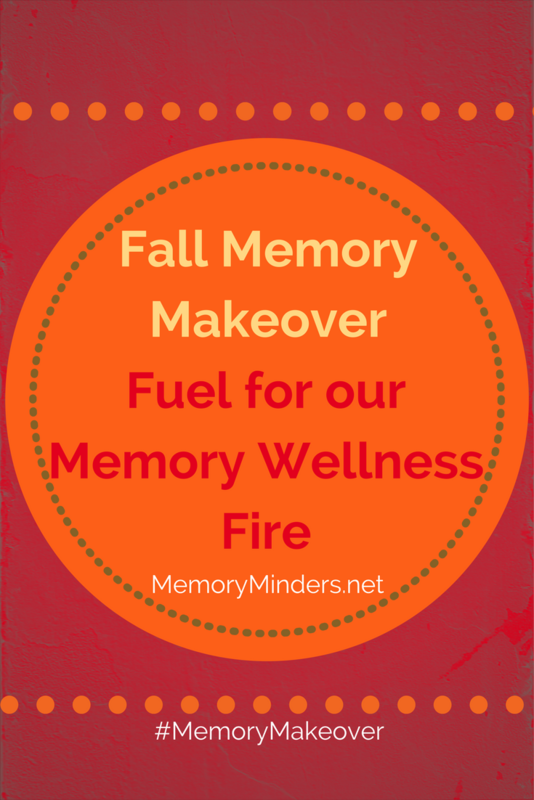 A few research articles this week added fuel to my fire as they related to our #MemoryMakeover theme of execution for this month. One discussed how cognitive training enhanced thinking and brain connections. This lent even more evidence to the basis of all our programming at MemoryMinders and gives us all more reasons to stimulate our brains. The other showed how even a bit of activity can lead to prolonged life. Both studies fuel our mind wellness fire. [tweetthis]Fuel your #memory #wellness fire with these tips for executing on your goals. #MemoryMakeover [/tweetthis]We each have various items to check off our memory wellness goals list we set in September, but we all can benefit from increased execution on our physical and mental fitness. I love simply cozying up by the fire, but these articles sparked my desire to not just sit and watch TV, but to do something while I warmed my toes. Read differently. Most of us read something every day, but we can easily take our reading to the next level. I’m rereading a classic with my daughter for her English class and we’re discussing the symbolism and other literary nuances. It’s our own mini book club! Whether it’s a book club with friends, digging into a new magazine, genre, or reading aloud, different reading will give our brains a new workout! Play a (new) game. Board, electronic, trivia, visual, listening or card-any game is fun to do inside on a cold or dreary day. Engage your brain by trying a new game alone or even better with friends! Challenge yourself by picking something outside your comfort zone and feel your brain synapses fire! Sit and _________. Stretch your back and legs. Write a letter or Christmas card. Draw a picture. Fold the laundry. Sew, knit, crochet or learn how. 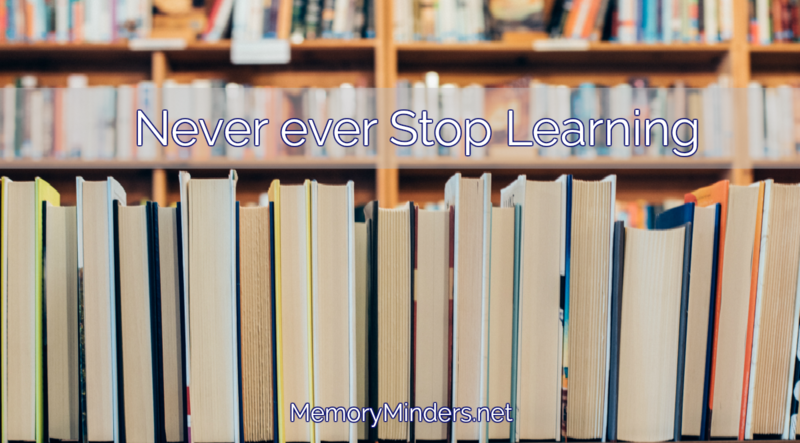 Do a MemoryMinders Academy activity. Many things can be mentally active while sitting. Don’t just sit, do something mentally challenging to enhance your mind and memory. Speaking of sitting, let’s remember that other article. It gave credence to what many of us know-checking things off our to-do lists can prove to be a workout-literally! Often, our daily activities of cooking, cleaning, laundry, walking to the mailbox or over to a neighbor’s actually count as exercise, especially as we age. This doesn’t mean we shouldn’t still aim for the recommended 150 minutes of aerobic exercise a week, but this study demonstrated how even 30 minutes of light physical activity can still lower our mortality by 12%. Moderate aerobic activity like in an exercise class or engaging with additional effort lowered mortality by 39%! An easy way to do this every day is to get up and do some physical activity six times a day for five minutes. This simple habit of frequent movement will check that 30 minutes of daily activity off our lists and keep our minds and bodies firing on all cylinders! Hopefully, these tips and research items provide some fuel for your execution fire as they did for me. Your #MemoryMakeover homework this week is simple: Keep taking those steps toward your goals and next time you enjoy a fire, don’t just sit there- execute! None of us are perfect. We are all human making multiple mistakes daily. Yet we chide ourselves when not perfect. Why? Is it because we don’t look like, can’t remember or do something like we used to? Working with older adults and watching loved ones age, I remind them it’s okay to let go of some of these youthful or perfect expectations. But do I? Often times, no. This month I’m focusing on letting go on my other blog and also here. 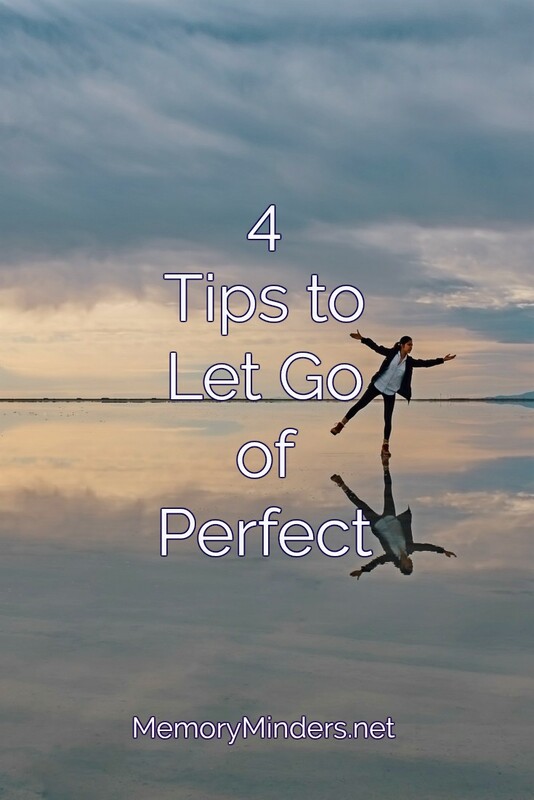 This week, let’s discuss letting go of perfect and/or unrealistic expectations. A good analogy is playing golf. Jack Nicklaus recently described how he now plays from a more forward tee box when playing golf. Even one of the greatest golfers knows he cannot hit it as far as he once did. Yet many of us know other golfers still trying to play from where they did twenty years ago! I wonder how frustrated they become when they can’t golf the same as twenty years earlier? I’m learning this too as I age. My 50-year body is not the same as my 20-year-old body. Yet sometimes, I expect it to look or function the same. That’s just plain unrealistic. But it’s how I feel. I’ve chided clients and loved ones for not using physical or mental assistive devices to help. They don’t want to use the walker, hearing aids or memory techniques. In their mind, they want to still function as they did years earlier. I understand as I do too, but I also try to help them be realistic. Being realistic means understanding things are not the same as they once were and that can be okay. Yes, our bodies and minds may not function like they once did, but there are things, people, and programs to help. Shift your focus. Instead of lamenting our plight when things don’t go our way, learn from what’s occurred to avoid, prevent, or at least try to improve for the future. Be proactive. This is the most important point and the cornerstone of our mission here at MemoryMinders. We all know many of the things we should be doing for our mind and body wellness but often don’t execute on them for whatever reason. Stop that cycle now. Choose to do one thing, then another to help. Be realistic and keep steadily putting one foot in front of the other. Last week on the blog, we discussed where we are on life’s climb. Whether it’s eating healthy, exercising mind and body or other lifestyle habits we can choose, it’s about offense instead of defense. It’s easier to consistently eat well and not gain 20 extra pounds than it is to try and lose them. It’s easier to keep our minds sharp now than try to regrow brain cells and relearn previously known things. Let’s be honest and realistic. We aren’t perfect and we’re still climbing either uphill or downhill in life. Move forward in a proactive way by letting go of unrealistic and perfect and choosing to enjoy life in a healthy and accepting manner. This positive approach can literally change us, physically and mentally. We use it constantly. The neurons are continuously firing, communicating, processing and initiating action. The effort we put forth to use our brains as we age is a huge factor impacting how well we function later in life. So what’s your effort level? Continuing our series on behaviors and habits we can all modify for our mind and memory wellness, let’s talk about maximizing our mind this week. We all have one which is involved in everything we literally think and do. Our brains. But how much we use it impacts how much we will or won’t lose it in our older years. Hereditary and environmental factors do play a role in our brain’s ability over time. But the one factor we all can control is our effort to use our brains daily. In childhood, young adulthood and even our middle years, we are challenged daily to use our brains in various ways. But as we age, we may want to rest on our laurels, take it easier and relax. We may think it’s our reward for all those years of maximizing our mind! 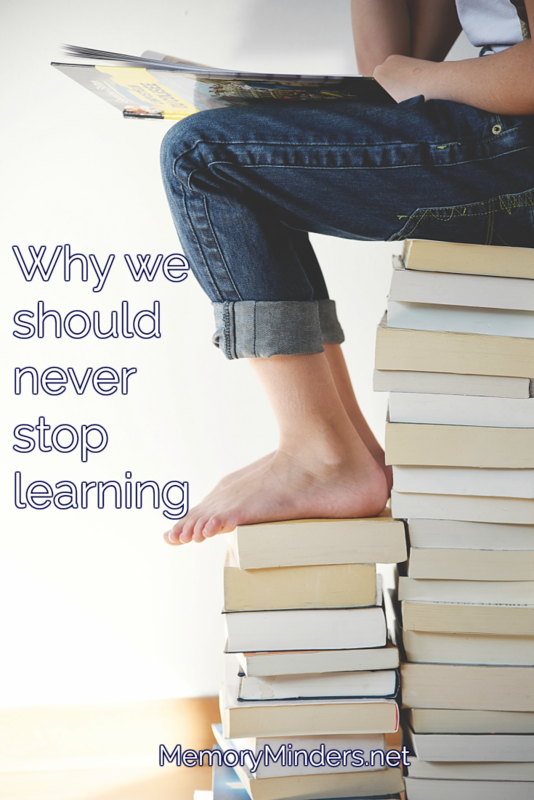 While this is true and studies show those with increased education levels have a higher cognitive reserve (brain power) to use as they age, we still can’t ease up on our effort in our older years. A recent study showed healthy adults carrying the gene linked to Alzheimer’s had a tougher time adapting to increasing cognitive demands as they age. This explains why cognitive tasks which seem easy become much more difficult over time for these individuals. But that’s a small percentage of the population. What has happened to the rest who seem to struggle cognitively as they age? I would hazard a guess they find it more comfortable in their comfort zones. By not stretching their brains and venturing out of their cognitive comfort zones, they are limiting their brain’s ability. Yes, it’s more difficult to push our thinking, learn new things and even fail the first few times we step outside our comfort zones. But that’s the beauty of the brain! Learn and utilize a new language. Learn or relearn a musical instrument. Take a trip near or far, exploring, observing and documenting along the way. Learn a new hobby you’ve always been interested in but hesitant to try. Keep up with technology-it can assist us in many ways as we age. These are just a few that scratch the surface of possibilities available to us all as we age. What are some ways you stimulate your brain daily? Chime into the conversation on Facebook or with a comment, I’d love to hear how you’re maximizing your mind as you age! If interested, check out our Academy service as one more way to help you boost your brain. 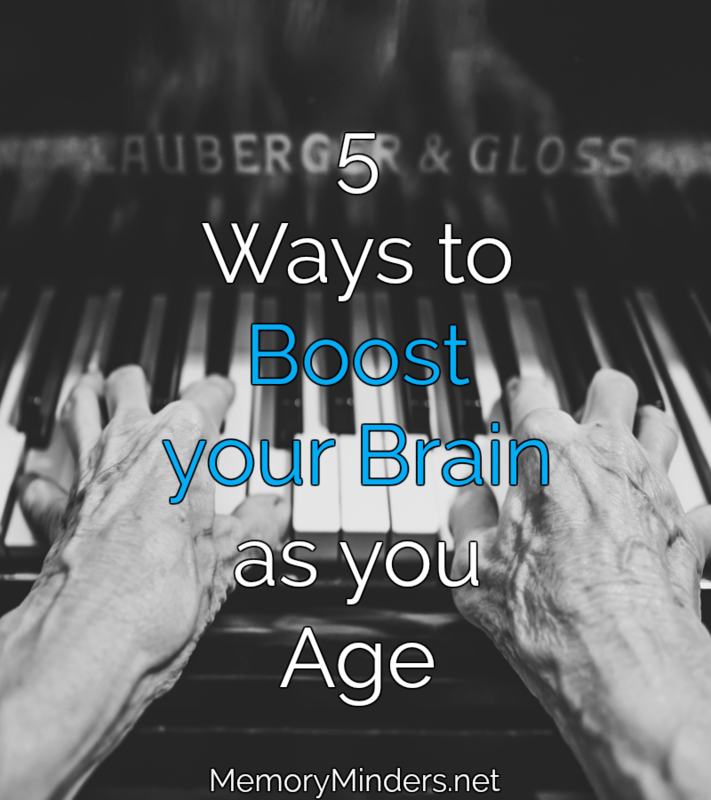 Let’s not let up on our brain boosting effort in our later years. Instead, let’s push ourselves to be the best we can be and maximize our minds! It’s summertime and the living is easy, right? Not always. The change of routine which comes with a change of season is easier for some, but can also create more difficulty for those with memory issues. Whether it’s a change of season, change of living environment or increased assistance needed, change can cause stress, depression and subsequently increased memory problems in many older adults. We dislike change in life because routine is easier. Change challenges our brains which often sheds light on lurking memory issues. It can also result from the progression of memory or health symptoms making it even more undesirable. So how can we ease periods of change to help those with memory issues? Keep the familiar and do one thing at a time. We want to challenge our brains. But too much stimulation can cause stress which is not good for our brains. While we always want to keep learning, we also need to balance the stress that change and too many new things at once can bring. Activate the Senses. We like familiar smells, fabrics, foods, and visual things around us. This creates a sense of security and comfort which is good. But it’s also good to pay attention to the sense experiences of new seasons, surroundings or people in our lives to help us remember. When we activate our senses, we have more information to help us remember and create new memories. Keep some familiar but also seek new sensory input. Associate and remember. Use the sensory information gained to associate the new season, environment or experience to help remember and begin to feel comfortable. It’s one of the easiest and most useful memory techniques. Use tools to help. Whether it’s a calendar to keep all the seasonal activities straight, lists to help adjust to a new environment, or music to help soothe the stress of change, there’s an app for that! Whether we use paper or electronic methods, using tools to assist with any new situation can help anyone’s memory, not only those with memory issues. Focus and train your Brain. Many times we can anticipate a change coming. When that’s the case, plan ahead and learn to ease the transition. Focus and pay attention to understand a new routine, change of environment or situation. When we focus and train our brain, the impact and stress of change is minimized. Stay physically active. When possible, keep physically moving. Change is difficult and exercise is often the first thing sacrificed in new situations. Don’t let this happen! Keep moving to keep both body and mind in the best shape possible to adapt to change. Changes in life are inevitable. How we prepare, plan, react and adapt can make change more positive for everyone involved. Try implementing these suggestions and please comment with any additional suggestions. Let’s see and address change positively in our lives and for those we care about most. Never stop learning. It’s one of the best tips regarding aging well. It applies to both children and adults and there’s a great reason why. I repeat over and again to exercise our brains. How we do this looks different at 20, 50 or 80 years old. But the principle is the same: keep those brain cells active. When we’re young, this happens without too much effort since much of what we experience is new. But as we age, more effort is often needed. As adults, we settle into what’s comfortable with good reason. We’ve spent our younger years learning and finding our comfort zone; what we’re meant to do with our lives. We want to stay here, polish our abilities and grow into our strengths. None of this is bad. But unless we continue to learn and stretch ourselves, at some point we’ll plateau. This occurs more often than we think. We become increasingly more comfortable as adults. 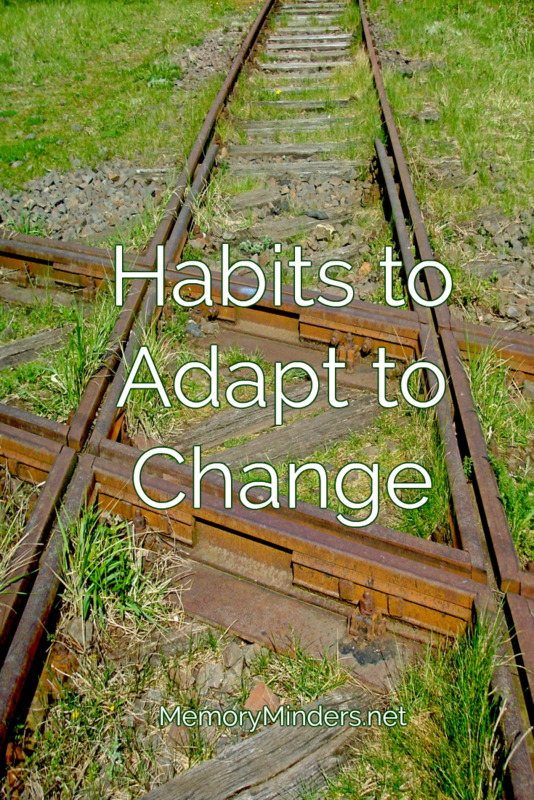 Bad habits seep in. We spend so much time finding what works, now it’s harder or we don’t want to step out of our comfort zones. Some even end up with a ‘mid-life crisis’. We look back at our lives and wonder if we’ll ever be or do what we dreamt of when younger. This learning habit helps regardless of age. As we learn, we exercise our brain cells in a different way than doing something familiar. Familiar is easier. But what if we get so used to routines and the same old, same old, we never learn or do new things? Brain atrophy ensues. Just like a muscle will shrink if not used, so will the brain. The brain is meant to be active and it’s why the adage ‘use it or lose it’ is accurate. If we use our brain in different ways now, it’ll be there when we’re older. It’s a concept called brain reserve. The more we create now, the better our functional capacity is later. The best method to exercise the brain is to learn something new. Give it a try and make it a daily habit! What new thing can you try or learn today? It doesn’t have to be anything monumental: it could be a new recipe, a twist to a favorite sport or hobby or even reading a different type of book. Let’s create this habit today and never, ever stop learning.